In our first session, we looked at the fascinating subject of the two objects that the Israelites were to use to be able to determine God’s will in matters of great importance. Now, let’s see how this method of knowing God’s will might apply to us as twenty-first century believers. The obvious answer is that we would love to have this kind of guidance in our daily walk! “Just tell me , ‘Yes or No’, Lord and I will do it”! It is human nature to want to know the future and what is going to happen and what we ought to do in response. We all want to be able to say, “God told me to do such and such” and have the future fall into place accordingly. This is why psychics and fortune tellers are such a novelty, because they claim to have a window into the future. However, God has not given us a direct means of divine guidance like the Urim and Thummim to make specific decisions. So, then how does He give guidance to his children today? The tool that God gives us for guidance is His Word. Although it does not have personal information about us, it does reveal God’s will for our lives. God’s word tells us what to do and what not to do; it has specific rules for our conduct. If we will read and obey the promises and commands that are contained in Scripture, we will know what God wants in every situation and we will be in His will. The Bible is not bashful in it’s discussion of life; it delves into every detail of the human experience. The better and deeper we know God’s word, the better and deeper we will know Him and what His will is for us. Guidance for life’s decisions comes through getting to know the guide! The next ingredient to knowing God’s will is, His Spirit. The Spirit helps us understand God’s word and to know His will for us. His spirit dwells within us to help us to know and to do His will (John 14:26). When He comes to live in us He starts shaping our minds and hearts. The Spirit give us peace of mind and helps us to make good choices. Whenever we are uncertain as to what to do, we should pray that the Spirit would illuminate and show us in the Word what the correct way or decision is. God will answer our prayer (James 1:5). The last thing that God uses to show us His will for us is circumstances, or just the way life unfolds. God uses the circumstances in our life to mold and shape us toward the goal He has in mind for us. What are our desires? What are we good at? What need can we meet? What do we have an interest in or compassion for? We look at the way the situation is unfolding and make the best choice we can. His leading is not often a direct revelation as much as it is His sovereign controlling of the circumstances of our lives, leading us in the direction we’re supposed to go. And, if we get to a point where His leading is not clear, we should wait on Him until it is. Nothing gets our attention quicker than someone writing or speaking about, “knowing God’s will”. We all desperately want to know about the future and we want to be able to ask God for direction and have him plainly give it to us. If you study the Old Testament and in particular the book of Exodus, you will discover the method that the Israelites were told to use to determine God’s will in matters of great importance. It will give you some fresh insight on your quest to know God’s will for your life. 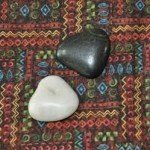 Let’s take a look at what the Bible calls the, “Urim and Thummim”. In our first session we will attempt to describe these objects and how they were used by the Israelites. Then in our second session we will try to apply it to our own walk with God. Let’s, ”go and see” what is entailed in this fascinating subject in the Hebrew Bible. 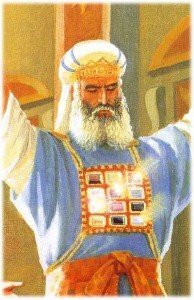 In Exodus 28:1-15, God gave Moses specific and detailed instructions on how to make the priestly garment for his brother, Aaron, the High Priest. Verse 15 says, “fashion a breast piece for making decisions”. The breast piece was folded double to make a pocket or pouch around the heart. Inside this pocket or pouch were placed two objects, the Urim and Thummim (read Exodus 28:29-30). They were to be close to Aaron’s heart when he entered the Tabernacle in the presence of the Lord. Apparently the Israelites knew what the Urim and Thummim were and how they were made and used, but the Bible doesn’t describe their appearance in any way, so we are left to guess as to what they were made of and looked like. They seem to have been some type of “holy dice” that were thrown to determine God’s will. Scholars speculate that they were made of stone, or bones, or some type of precious gems – similar to what was on the rest of Aaron’s breast piece – however, we just don’t know. The Hebrew meaning for these words is interesting, also. The Hebrew word, “Urim” begins with the first letter of the Hebrew alphabet (alef) and Thummim begins with the last letter (tav), which is interesting in that it seems to indicate that it covers the whole spectrum from beginning to end. “Urim” means, “curses” and “Thummim” means, “perfections”. Scholars speculate about how they were read and actually used. One suggestion was that in a series of rolls, if “Urim” (curses) came up the most, then the answer was no. If “Thummim” (perfections) dominated, then the answer was yes. Also, it has been suggested that perhaps they were different colors such as black and white, with the same type of scenario for getting an answer. Or, possibly they could have been an object with two sides, like a coin, with “Yes or No” on them and they were tossed into the air to get an answer. We really just don’t know how exactly they were used. What is interesting though is that they were often used in time of crisis to determine the will of God. They trusted God to reveal his will to the High Priest through this decision making breast piece and objects. Proverbs 16:33 says, “The lot is cast into the lap, but it’s every decision is from the Lord”. There are several stories in the Hebrew Bible where the Urim and Thummim were used. Joshua, in Numbers 27:21, was commissioned to succeed Moses and was instructed to go before Eleazar, the high priest and to obtain decisions from him by consulting the Urim. Joshua knew when to stay and when to go by consulting the Urim and Thummim. Saul also consulted the Urim and Thummim in 1 Samuel 28:6, but he didn’t get the answer he was looking for. Later, David received clear direction after consulting the ephod on attacking the Amalekites (1 Samuel 23:1-2,9-12 and 1 Samuel 30: 1-8). The Urim and Thummim are mentioned in Nehemiah when they were rebuilding the wall and returning to Jerusalem from Babylonian captivity. A question arose as to who were eligible to become priests, since all family records had been lost (Nehemiah 7:65 and Ezra 2:63). In these verses the men were told to wait until the priest could use the Urim and Thummim. There are many other examples in the Bible where, although not specifically mentioned as the Urim and Thummim, lots were cast to make important decisions. It is very important to note here that only the high priest was allowed to consult the Urim and Thummim, and only in matters of great concern to the public good, and in instances where men could not possibly know the answer. The answer was not considered just a matter of chance, but God giving his judgment, his decision as to what to do. Now, that we have some basic knowledge of what the Urim and Thummim were and how they were used, let’s see if we can apply it to our walk and our desire to also know what God’s will for our life is.